No talking in the elevator! my hands at the school, the office, the mall, and my language class. this! 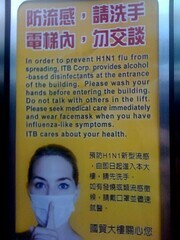 Second there have been 6 swine flu deaths in ALL of Taiwan! it a name or number does not make it any worse than it was before. cannot talk and what is the point of the mask if I cant talk with it on? over with my pram and stick you in my bum bag. and then coming back to give teacher a big hug.